Be sure to check out the first of the 50 Great Reads selections on SecretBuilders, The Odyssey by Homer. 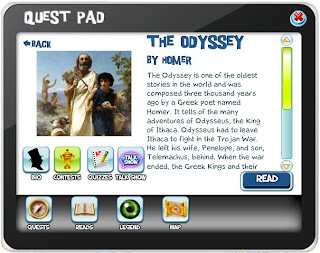 There's tons of activities to do: read excerpts from The Odyssey, learn about the author, go on a quest, take quizzes, and enter cool contests. Also, don’t forget to attend the live talk show with Odysseus, the King of Ithica. The talk show will take place on Wednesday February 29 at 4 pm SB time. The Odyssey is one of the oldest stories in the world and was composed three thousand years ago by a Greek poet named Homer. It tells of the many adventures of Odysseus, the King of Ithaca. Odysseus had to leave Ithaca to fight in the Trojan War. He left his wife, Penelope, and son, Telemachus, behind. When the war ended, the Greek Kings and their soldiers returned home but Odysseus having angered the sea god Poseidon, faced one peril after another at sea and did not return for twenty years. Meanwhile Penelope and Telemachus waited for Odysseus while several princes tried to take over his kingdom. Eventually, Odysseus returned home and together with his son, regained his kingdom.